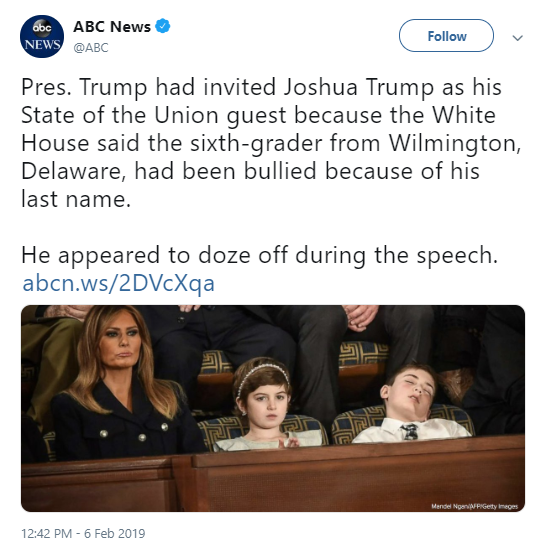 Who could forget all of the memorable State of the Union moments throughout the years? Like that time that George W. Bush warned against human-animal hybrids. And the time that Barack Obama made the nation cringe at a joke about spilled milk. And the time that Marco Rubio drank eleven quarts of water during his response. But that doesn’t mean this year’s State of the Union was devoid of action. The event represented one of the first big opportunities for the approximately 631 Democrats running for president to differentiate themselves from the field. We took a look at what some of the top contenders did with email, social media, and digital ads after the State of the Union, and what it might tell us about the digital arms race to come in the 2020 Democratic primaries. In the hours after Trump’s speech concluded, Senators Warren, Harris, and Gillibrand sent out fundraising messages. Two of the three candidates included a low-dollar ask (at least for the email account we used to review their messaging, which is not tied to a donor history for any candidate). And for prospect messaging, that makes sense—our own testing shows that low dollar asks to non-donors audiences pay off in the long-run. 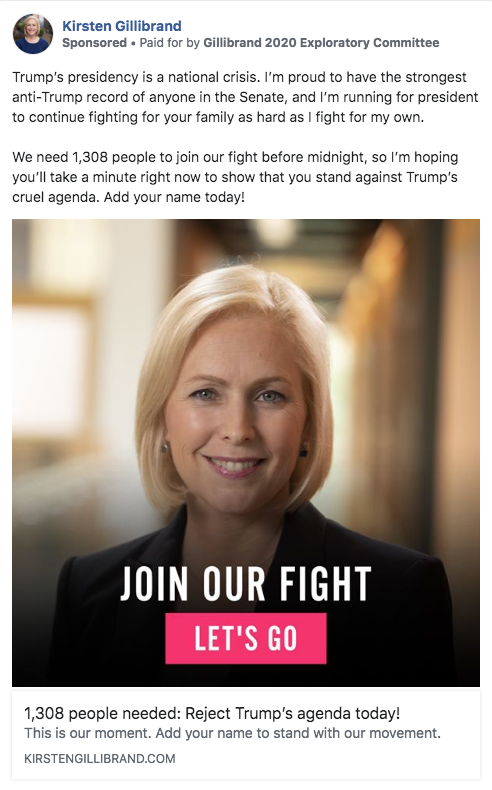 Senator Gillibrand didn’t bother waiting for Trump to finish lying about immigrants and signing congressmen’s ties (yes that really happened) to reach out to her supporters. She asked supporters to share their concerns about the administration and the issues that they want her to work on by taking a five-question survey. In a similar vein, Secretary Castro sent a survey after the speech asking supporters what they wish President Trump had said during his speech. It’s clear that both candidates are interested in showing potential voters that they are listening to constituents, and they want to represent them and be accountable to them. You know, because that’s how a democratic government is supposed to work. Candidates also worked on cultivating their reputation and raising their profiles on social media. 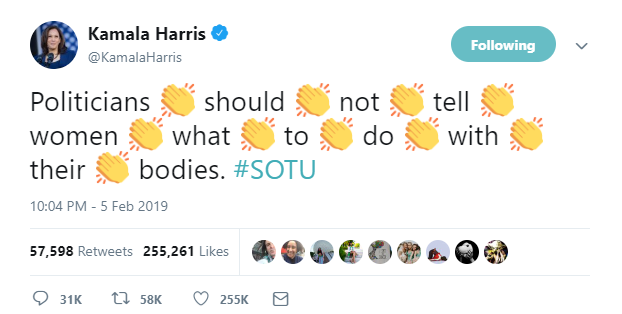 Senator Harris and Rep. Gabbard did this best by live-tweeting responses to the State of the Union. By sticking to quippy statements constituents can agree with, they got lots of retweets and were able to show America what they stand for—and who they stand against. Missing from the SOTU response picture? Digital ads. While the Trump campaign ran over 6,800 ads to build their list, fundraise, and generally mobilize Trump’s base in the days leading up to the SOTU, we couldn’t find a single ad run by a Democratic candidate specifically about the speech or its content on Facebook’s ad archive. Instead, candidates seem to have just kept their tried and true creative running. Maybe they increased their budgets, but we didn’t find any special creative related to SOTU. That being said, a lot of the creative that is working is already anti-Trump so while it doesn’t say anything about the “State of the Union,” it was all very appropriate for the moment. At this point, most candidates seem to be in the “Join Us” and “Tell us about your priorities” phase of their campaigns. Because of their high profiles, large audiences, and giant budgets (not the mention the smart and experienced staff they attract), presidential campaigns are often innovators when it comes to digital tactics. We’ll be keeping a close eye on the leading campaigns between now and November 2020 to spot the trends and see what nonprofits can learn.